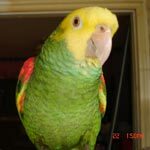 Parrot Forum • View topic - Is my bird okay? I mention diet because it may or may not be relevant. Everything was fine, droppings are normal, same loudness, same affection, same energy levels. Last Thursday, I noticed this odd smell when he was grooming himself. This present day I think it's coming from his breath or something inside him. But last Thursday I just ignored it. Noticed the same smell Friday, Saturday, up to Monday. I thought maybe it's just his new smell or something. His behavior and droppings all normal. Everything was fine until around the afternoon of Tuesday. I noticed he almost stopped eating completely. He was fluffy a lot, and was closing his eyes, appearing almost sleepy. He also drank an excessive amount of water. I put him in my room so he could sleep and maybe feel better. I came back and he got out of his bed, ate no food but drank a lot of water. I noticed his upper chest (crop area?) was more outwards. He also looked like he wanted to vomit. At this point I thought something was stuck in his throat maybe, and maybe that's why he didn't eat the whole day. His dropping were basically all liquid. I took him to the vet, and later threw up. It was mostly water. Vet said he was regurgitating. I then noticed that the vomit smelled exactly like the odd smell I was picking up on the past week. He gave him a shot of metoclopramide. He put a tube in him to extract food, examined the food and ruled out a fungus infection. He said to see how he is in 24 hrs. Wednesday and today (Thursday), his activity is completely back to normal, droppings are normal, energy normal, etc. But this evening I can smell that weird smell again when I smell near his beak, especially if I open it. The vet said regurgitating, so I was googling to see the difference between regurgitating and vomiting. Regurgitating is normal and is a sign of affection as he's giving me food (mushy food). Vomiting is not normal and is mostly liquid (which is what he threw up that time), but I'm no vet and I can only assume so much. The only other thing I can mention is I gave him a raspberry on Tuesday that wasn't the freshest. Could that have been it? If so, why can I smell this weird smell from him all the way back to Thursday? Should I be concerned? Was he regurgitating or vomiting? Should I care about this smell? I mentioned diet in the beginning because I read a lack of vitamin A can cause vomiting. I don't give him a whole lot of veggies because he just drops them. Can a lack of vitamin A actually cause vomiting? The raspberry? Some rare virus? Any advice would be helpful. If he vomits/regurgitates or shows odd behavior like not eating/drinking a lot of water, I'll take him to the vet. Also, why was he drinking a lot of water in the first place? Re: Is my bird okay? I am far from the most educated human slave to my birds. This is only an idea and may be corrected by another. To me it seems that he had a blockage and could only swallow water. I am not saying I am right just that the idea came to me when I read your post. When the vet used a tube for a sample he dislodged whatever was blocking the way. If he is back to normal you can calm down for a while. Stay alert though. I would be afraid that it could be a future problem also. Welcome to the forum and I am sorry your bird is not doing well. Now, I doubt that the vet you saw is an avian vet or that it has enough experience in treating birds because no avian vet is going to confuse vomiting (which is what your bird did) with regurgitation. I also doubt that a real avian vet would have intubated a bird instead of doing a choanal swab (which would have given the same result without the trauma/danger of the intubation). Plus, there is no way he can say with any certainty that there is no fungal infection without doing a culture which takes five days. And, to close the deal, avian vets know better than to give an injection to a bird the size of a GCC (the muscle tissue damage is real bad and the smaller the bird, the more damage a needle does to them). Going just by what you tell, I would say that he has an infection because, although you don't describe the weird smell, it's pretty much the only thing that causes their breath to smell bad. I would also say it's fungal because, although they can get a bacterial crop infection, 99% of the time, it's fungal. But, at this point in time, it could be both because once the immune system is depressed by a long term infection - and for your bird to have the symptoms you mention, he must have had this for quite some time even though you did not notice anything (I am not blaming you, mind you, birds hide symptoms and it requires a very experienced eye to see the subtle differences in their behavior, weight, etc). It's not a lack of vitamin A (pellets have plenty of it), it's not the over-ripe raspberry (birds eat over-ripe and even rotten fruit all the time without a single consequence) and I doubt it's just a common virus but it could be PDD... I don't mean to scare you but this is a distinct possibility when you talk about a problem with the crop added to weight loss, lethargy and vomiting. And the injection this doctor gave him is a medicine used pretty much exclusively in birds with this terrible disease. Personally, I would take him to a better vet and have a complete physical on him (meaning complete bloodwork) as well as have him tested for bornavirus (what causes PDD). And don't wait. Pajarita wrote: Welcome to the forum and I am sorry your bird is not doing well. I just went to a general vet, he wasn't specifically an avian vet. It's hard to say whether it was vomiting or regurgitation because while vomiting is usually only liquid, he was only drinking water. If there's no food to throw up, and there's only water in him, its hard to tell the difference I assume. He ruled out a fungal infection by doing a crop smear cytology. It took him 15-20 mins to do this test. I'm not sure if that's similar to a choanal swab. My GCC weights 75 grams. He doesn't appear to be losing weight. Do you think the needle has damaged him in any way? It was around the stomach area or somewhere around there. And all of these came pretty much at once, it wasn't like he displayed one a few days ago and another later, it was all at once. Is there any way to diagnose exactly what it is? He's been completely normal Wed, Thurs, and Friday (today). His droppings are the same color and size, same activity level, same loudness, etc. Thank you for your reply, I do appreciate it. I'll definitely keep a closer eye on him. Third day and he seems completely normal. Would you happen to have any idea what could cause the blockage? I didn't give him any food that was out of the ordinary. So unless he swallowed something incorrectly, I'm not entirely sure how or why. Watch those general vets, they are great with cats and dogs but know nothing about birds. I once took a budgie to a general vet for an illness, she injected it with antibiotics and it died right there and she charged me for the privilege. My ferret was sick and not eating. I took him to the vet but he was not an Exotic Animal vet. He diagnosed it was a viral infection and gave her a shot. I took her home but she was not getting better. I was afraid of hydration because she did not have the strength to get up and drink. We lucked up. I had to work but my momma and aunt were visiting from NJ. Aunt Betty has such a heart when it comes to furrys. She gave it water with a dropper all day and into the night. She did not dehydrate and had a wicked case of diarrhea the next day. My aunt was still holding her in a towel when she shot out a piece of green rubber that was blocking her bowel. Within minutes she was eating and playing. Regular vets can't take care of exotics and usually misdiagnose. Our maternal care is the only thing that pulled her thru. I also wanted to bring up again that if anyone know of an Avian Vet in Citrus County or around it please let me know. My kids have not had a checkup in about 2 years. They seem to be thriving and the Amazons get through to me when they don't feel good but the Tiels hide illnesses until it it too late. We don't have an avian vet around my area. The place I went to is AAHA accredited if that makes any difference. No, AAHA accreditation makes no difference (it's just a hospital or clinic accreditation, not a guarantee of any specific knowledge in the vet's part). You need to take your bird to an avian vet because what you consider normal might not be normal after all. We had a member here who had to put down a 5 month old bird from what the avian vet said was a problem he had from birth (hugely high levels of glucose). When I said that the bird must have had symptoms from the beginning (there is no two ways about this because all animals that have excessive sugar in the blood produce a very large amount of urine and drink a lot of water), he got very offended, insisted there had been no symptoms and left, never coming back. But the truth is that if you don't have any point of reference on what is normal and what is not, there is no way you can actually tell - not with birds. We can tell with dogs and cats because they are mammals and their body functions follow, more or less, the same parameters as humans but birds are completely different. Sheesh, even super experienced bird people miss symptoms all the time because the birds not only hide them and, if on top of that, you have not had the same species in the past, you really have no way of knowing what is good poop, behavior, energy level, etc. Your bird did not regurgitate, he vomited. Regurgitation never happens when the bird is sick and it doesn't happen spontaneously, either. The birds want to regurgitate, they make it happen, it's not something that comes out of the blue - and it would never happen in a strange environment or with a stranger doing a physical evaluation. And, if he is pooping, there is no way he has a blockage, either. Personally, I would take him to an avian vet for a complete physical even if I thought he was now back to normal because that bad smell, the vomiting and lethargy were caused by something and your vet did not do any real diagnostics. I know that he did a cytology but, for a fungal infection, you need to do a culture because although a cytology (this is a test that looks at cells under the microscope, basically) might show something, normal brewer's yeast and candida, for example, look the same under the microscope. Best case scenario, he has candidiasis which is a bummer to cure properly but perfectly doable (and you would also have to revise your entire husbandry because birds only get fungal infections when they are stressed out to the point that their immune system is compromised). But worst case scenario he has PDD and this is fatal. There is no cure... the treatment is difficult and expensive and all it does is improve life quality for a while. The polyoma vaccine is nothing but a gimmick UNLESS the breeder has breeding birds that were sick with it and have now become carriers -which we hope it's not the case with yours. Pajarita wrote: No, AAHA accreditation makes no difference (it's just a hospital or clinic accreditation, not a guarantee of any specific knowledge in the vet's part). You need to take your bird to an avian vet because what you consider normal might not be normal after all. We had a member here who had to put down a 5 month old bird from what the avian vet said was a problem he had from birth (hugely high levels of glucose). When I said that the bird must have had symptoms from the beginning (there is no two ways about this because all animals that have excessive sugar in the blood produce a very large amount of urine and drink a lot of water), he got very offended, insisted there had been no symptoms and left, never coming back. But the truth is that if you don't have any point of reference on what is normal and what is not, there is no way you can actually tell - not with birds. We can tell with dogs and cats because they are mammals and their body functions follow, more or less, the same parameters as humans but birds are completely different. Sheesh, even super experienced bird people miss symptoms all the time because the birds not only hide them and, if on top of that, you have not had the same species in the past, you really have no way of knowing what is good poop, behavior, energy level, etc. Unfortunately, there are no avian vets within 120km of my area, and I do not have a car. I wouldn't say the smell is "bad", it doesn't smell foul. If I had to put a word to it, maybe it smells something like cheese. Obviously I'm not a vet, but I will try to describe the situation as best I can, in hopes that maybe we could narrow it down to something maybe more specific. If you say PDD or Candidiasis again, so be it. I'll just try to give more details in case that can help you give a more accurate guess. Active, loud, normal droppings (normal as in brown with white, it's always been like this), eats regularly, grooms daily, sometimes during the day and then for about half an hour at night. Not active, quiet, watery droppings (he was not eating at all), drank a lot of water, crop looked bigger than normal. Is it normal for Candidiasis or PDD to give him all these symptoms at once? It was quite literally a 180 change, and all of these happened at once. As of right now, I don't see any white spots in his mouth. His weight for the past 4 days has been 74-75 grams. His voice sounds the same. I haven't caught him rapidly breathing or breathing loudly. His beak looks normal, his feathers look the same color and in general look the same. The feathers around his crop look normal as well, I just mention around the crop in case somehow a fungus or virus or anything else would affect the feather area of his crop. His ears look the same color (I check once in a while to see if something is odd looking). I give him pellets daily, seeds every other day (not too many), and some fruits. I occasionally give him small amounts of chicken, sometimes rice, rarely pasta. I change his water twice a day. I clean the bottom of his cage weekly. I try to aim for twice a week but I haven't been doing that. I wash my hands if I arrive home before taking him out, or if I touched something dirty or not good for him (chemicals, markers, tools, etc). He usually gets around 10 hours of sleep. His water is usually bottled water (nestle) but I've been using filtered tap water because I ran out of bottled water. He usually is only fluffy when I pet him or when we play fight. Hopefully that information reveals something. If not, that's okay. I forgot to ask, do you think the needle that the vet gave him has affected him? Damaged him something? Or the tube that went inside him? You mentioned trauma.